A native of Lebanon helps expand the global health care market from Detroit. Not many businesses — let alone wealth management and capital advisory firms — are launched from a hotel room. But in 1998, tapping into $45,000 he had saved as a district manager at American Express Financial Advisors, Osman R. Minkara rented a room at the Quality Inn at 12 Mile and Orchard Lake in Farmington Hills and started CIG Capital Advisors with five employees. 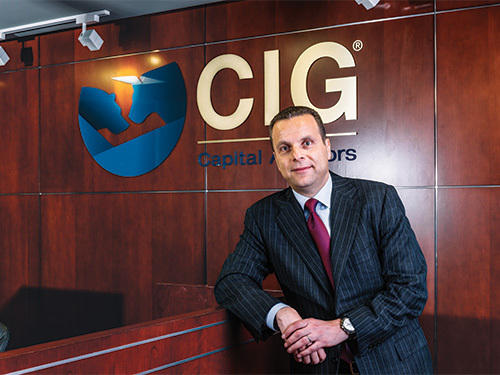 “Since I had no credit established, I couldn’t rent office space in a short period of time, so the hotel room seemed like a good idea,” says Minkara, founder and managing principal of CIG Capital Advisors. Today, with 50 employees in Southfield, the firm specializes in three sectors: wealth and asset management, alternative investments, and business advisory services. The asset management division was launched in 2007 and, after the first year, it had $17 million in assets under management. Last year, the division reached $200 million in such assets. Growing up in Lebanon, Minkara, 45, attended dental school, but he says he didn’t have the passion to finish. Following the advice of his brother, who was completing his residency at Wayne State University’s School of Medicine, he moved to Detroit. After learning English in his first semester at Wayne State, Minkara took a job in the university’s archive collection, and eventually moved his way up to the finance department to complement his degree program. University of Oxford. After a few years with American Express, he could no longer tamper his drive to become an entrepreneur.